Kids Kingdom Day Care transpired to provide excellence in early years care for all children. 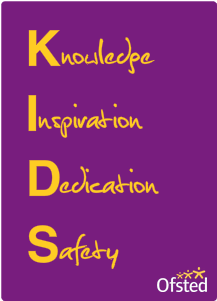 Our ethos circles around a simplified yet amplified philosophy - 'Every Child Matters'. Our focus is for all children to 'learn through play', in a safe, developing, and nurturing environment. We take pride in dedicating ourselves to each and every child throughout their nursery life, arming them with the necessary tools required before they embark upon their lifelong journey. With a team of qualified, experienced and caring staff, Kids Kingdom Day Care fulfils aspiration by offering inspiration by way of individually developing a curriculum for each child. Furthermore, Kids Kingdom Day Care is the bridge between parent and child by creating a special 'kingdom' which children can call home.